Life-long Rosebank fan and Falkirk native Scott Jackson was inspired to start collecting whisky by his father-in-law. Now with the site’s reopening on the horizon, he tells Angus MacRaild what made him fall in love with the distillery in the beginning. ‘I mainly collect Rosebank, my hometown distillery, plus old blends and grains but I've acquired bottles from most other distilleries over the last 30 years. I've been going to Islay for about 20 years so have picked up a fair number from there, particularly Ardbeg and Lagavulin, my second favourite distillery. I got into whisky because I like the aroma, taste and flavour. Also, I've always been interested in industrial history and I studied chemistry and engineering at university. How has being a collector impacted on the rest of your life? 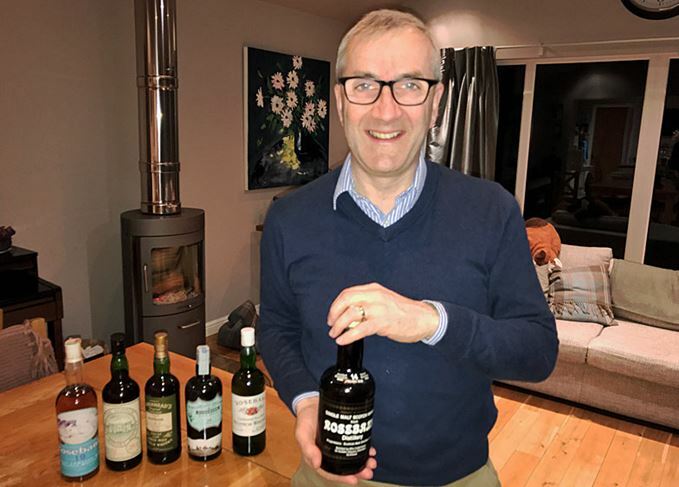 ‘When I started collecting seriously it was mainly Rosebank and, although prices were modest by today’s standards, I still felt a little guilty at spending too much on whisky. Especially given we had a young family at the time. Though I'm lucky, my wife has always been supportive. There have been plenty of examples of compulsive and obsessive behaviour and queuing or travelling to get the latest release. I remember staying on Islay and driving up to Caol Ila at 5am to get the single cask Port Ellen that was released back in 2008. The German guys were there already of course, having camped out all night. Given the prices of old bottles these days, has this affected the way you view your collection? Do you consider it more an investment? Are you pleased Rosebank will be revived? What are your hopes for the new distillery? What are your favourite Rosebanks from a drinking perspective? What are your favourite bottles in your collection? What would be your holy grail bottle or bottles to find? What are your go-to everyday drams? ‘Generally normal strength blends or Highland or Speyside drams, nothing too heavy. I really like Johnnie Walker Green Label which I think is still great value for money. I’d also say, pound for pound, Lagavulin 16 is hard to beat, although it’s a reflective “late at night in front of the fire” kind of dram. What are the best whiskies you have ever tasted? What has been the greatest whisky experience of your life so far? The whisky vlogger on how he ‘collects’ whiskies for others to try as much as for himself. The winemaker’s fondness for rare Highland Park bottlings came about during a trip to Italy. The Belgian electrician who came late to whisky, but indulges his passion to the full. It was whisky’s storied history that turned museum worker Josh Feldman into an avid collector.